I never thought I would see this day. Look up at the sky. There is a good chance pigs are flying around. I hold in my hand the new Guns N' Roses CD Chinese Democracy. After 15 years Axl and the boys, wait, just Axl is finally back. The most surprising thing is that it's good. Correction- GREAT! This sounds like something that should have come out in 1990. Heavy guitars, good tempos, and fist pumping fun. Check out Shackler's Revenge, Riad N' The Bedouins, and There Was a Time. Skip the ballads like Street of Dreams and This I Love. 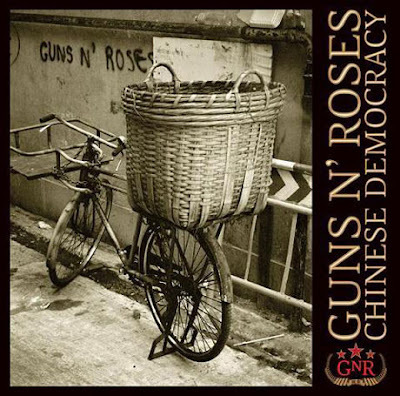 By far Chinese Democracy is better than anything Velvet Revolver ever did. One of the best CD's of 2008. I hate to do this but either I'm blind or what not but couldn't find any contact info here to send you an e-mail. I wanted to know if you would be interested in swapping links? I noticed the Penguins and Pirates in your title and I run a Pens site and Pirates site. I have TIGO added to the links pages at both. Once again, sorry to clutter up your comments section with what one would consider spam.